I’ve learned to quickly scan for cactus before placing knee, hand, mid-section or posterior on the turf in western North Dakota’s badlands. Cactus needles are about as effective for such training as a shock collar is on hunting dogs. Once the cactus coast was clear I laid down slowly and carefully in preparation for crawling to the crest of a ridge. On the other side was supposed to be a three-point mule deer buck bedded in an old hillside burn. My confidence in the presence of that buck wasn’t exactly high. I was used to having mulies not be there when I finally arrived at the end of my stalk. I’m not always sure why, but they just seem to be gone when I get there. That’s why I hate them so much. The wind was strong and blowing from left to right as I caterpillared my way to the top. I glassed every inch of that burn with every inch of my approach. My goal was to pick out those stiletto antlers before the buck could see me. Unfortunately, I was hunting alone and miscalculated the precise location of the buck. I was a little too far up the ridge. Thinking it was safe to crawl a bit higher I edged up on my elbows. When I looked forty yards to my far left, there were the beady, black eyes of the buck, locked on me like a missile guidance system. Foiled again! Being a young buck, he just stared as I slinked backwards out of sight. I quickly crawled down the ridge to gain some yardage, but by the time I re-crested the ridge the buck was up and nervous. He bounded away, unscathed. I almost had a 25 yard shot. That’s usually about how close I get to taking a mule deer with a bow - almost. I hate mule deer. And I love mule deer. I know it’s weird, but hey, I’m a bowhunter. Mule deer frustrate me terribly. I suppose I don’t get nearly enough practice hunting them, but then we never seem to get enough of the best challenges. 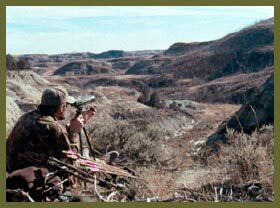 Most of my mule deer hunting has been in Montana, or my home state of North Dakota. The Montana hunts were mostly ancillary to my elk hunting efforts. Once in awhile we’d come across an opportunity to take a mule deer, but they weren’t our focus. In North Dakota, I hunt mule deer by design, whenever my schedule allows, which, as mentioned, isn’t nearly often enough. I’ll travel to the badlands of western North Dakota and spend a few days playing chess with the bucks. They almost always win, but I sure have fun trying. We don’t see many huge mule deer bucks in North Dakota, or even lots of deer compared to years gone by, but there are enough bucks to put the test to your glassing and stalking skills and that’s what makes this type of hunting so much fun. Last October, I spent three hours watching the aforementioned 3X3 browse in the morning sunlight. Without my spotting scope the buck would have been invisible from the oil road. I watched him work his way along a distant hillside, munching on browse with several does and fawns. Then, as if someone blew a whistle, he trotted up near the top of the ridge and plopped down in a well-used bed - a bed which I believed was within my bow range from the top of the ridge. It looked like a good stalk opportunity so I struck out across the cuts, draws and canyons, threading my way toward the backside of that ridge. It took me two hours to get to the point where I crawled to the top and while I was lucky enough to get there before the buck left, it just didn’t work out. So what else is new? In that case, it would have been nice to have a partner along. He could have watched from a distance and directed me to the buck’s bed. It would have taken only a couple quick hand signals, visible through binoculars, to send me those 15 or 20 valuable yards down the ridge before I took the chance of peaking over. Mule deer have an uncanny knack for spotting movement on the horizon and that’s why they live where they do. There is plenty of horizon in open country such as the badlands and it can be difficult to make your way anywhere without breaking the skyline at one time or another. That’s one of the things that makes mule deer hunting so difficult for bowhunters. 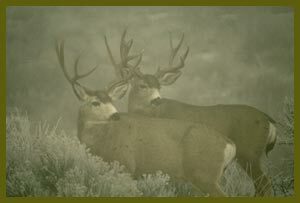 In fact, I consider mule deer, at least mature, quality animals, to be one of bowhunting’s most difficult challenges. I’m not mule deer expert, but here’s a few things I’ve learned about bowhunting these deer I so love to hate. 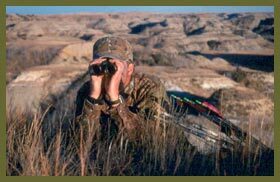 Location Location Location - Always start with the fundamentals and that means to hunt where the mule deer are. Even within good mule deer range, there are areas that hold deer and areas that don’t. For example, in North Dakota, there are areas studded with juniper and cedar and the draws are exceptionally deep. The cover is tremendous and you would expect the mule deer to call those areas home. However, I’ve had much better luck locating animals in the brushy draws where buffaloberry, and scrub oak grow. They just don’t seem to like the thick cover in the cedar draws. Why, I don’t know, but I never argue with game animals. This is really the essence of what experience does for you. Hunt an area long enough and you’ll discover what kinds of habitat hold deer on a consistent basis. Quality Glasses - There’s no substitute for quality glass when hunting mule deer. A spotting scope is a must and a good binocular is even more important. I’ve used Zeiss, Leica and now have a pair of Swarovski EL 10X42 binoculars. All are incredibly sharp, clear and bright and it really comes down to ergonomics and personal preference when choosing high quality glass. Mule deer hunting is where you’ll see the benefits of quality glass. Most binoculars will reveal the antlers on a distant buck. Good glass will allow you to count the points. Quality glass will let you pick out an antler tine in heavy brush because the light comes off the surface of an antler differently than it does a branch. From a prone position, my hunting partner and I will often scan a draw for an hour before making the next move. Occasionally, one of us would pick out a rump, ear or antler of a mule deer and the other would take several minutes to locate the same animal, even with directions. But the clarity of the glass is what made it possible at all. Sometimes it took fifteen minutes to determine if the deer was a buck or doe, waiting until they finally turned their head. With inferior glass we would not have spotted as many of those animals, much less determine if they had three or four points. Hunt Deliberately - Find a good vantage point in the early morning and spend those valuable first hours locating deer. It is rarely beneficial to just start wandering around trying to stumble on a mule deer in open country. Seldom are they surprised to see you. Once you watch a buck go into a draw or over a ridge you’ll have to work your way into position to continue to scan for the bedded animal. If it is sunny and warm, concentrate your search in the shadows. Mule deer like to bed where they can see downwind, but they don’t like the hot sun. Watch the Wind - As always, the wind direction is critical and it may be necessary to detour the long way around to get the best approach. The wind tends to channel up or down a draw and it does some weird things when it comes over a ridge top. It can never be trusted in such terrain, but then most bowhunters know that already. Other Deer - Beware of other deer that could spook and spoil your stalk. Many a muley buck has survived because a doe or fawn spotted the danger and set off the alarm. A lone buck is something to look for, and stay with, if possible. Also, watch for cattle. 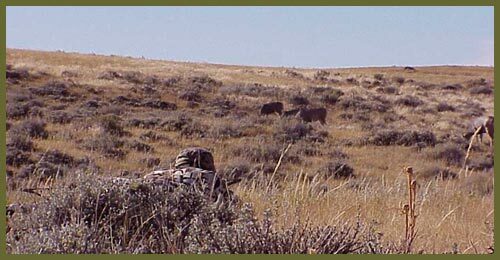 I lost a great opportunity at a bedded non-typical buck last fall when a herd of a dozen Herefords bolted from a draw as I snuck around a small butte. Don’t lose your focus, but still be aware of everything else around you. Sun Position - It’s always nice if the sun is at your back, and you read about that as an advantage, but it’s not often when the terrain, time of day, location of a deer, and the wind direction, all conspire to provide such a happenstance. If the sun happens to be at your back, it can help, but then you have to watch your shadow also. Throw your shadow across a buck’s view and it’s all over. 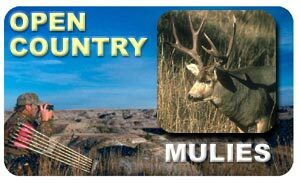 Read the Terrain - Learning to read terrain is another requirement of mule deer hunting. You will learn what you can and cannot do just by failing, or maybe even succeeding once in awhile. Planning stalks that sometimes take hours is a great challenge and part of the allure of mule deer hunting. It’s what makes it fun. Prior to your stalk, take note of landmarks and their relation to the deer. Drawing it on a piece of paper can be beneficial because everything will look very different once you close in on your quarry from another direction. Having a mental, or paper, note of whether the buck is above or below a deadfall or boulder, for example, can make the difference. Silence is paramount - Those big ears aren’t for looks and a quiet stalker will cuss less. It can be difficult to stalk arid, almost desert-like terrain, especially in a September heat wave, but it can be done. Removing boots or using some of the fleece boot covers helps. A good breeze is almost essential, but too strong a wind can make shots difficult. Move slowly and watch the little things. I’ve knocked loose tiny pebbles that have ruined a stalk. Mule deer seldom tolerate noises they can’t see and will almost always be up, or gone, when you get there. Break your Syline - Skylining is a cardinal sin. In my experience, mule deer have much better eyesight than a whitetail. Any sort of movement on the horizon seems to be especially noticeable to a muley and has brought many stalks to a premature end. It may require some backtracking to get around the terrain, but don’t expect to go undetected if you break the horizon. Mulies Don't Forget - Here’s another annoying trait mule deer possess. When they see something out-of-the-ordinary, they do not forget it. They will stare at it until it moves again, or disappears. Then they do the same. If you inadvertently catch the attention of a whitetail, then freeze, it will often go back to what it was doing. A mule deer doesn’t seem to have that weakness. Once spotted, you are busted. Use a Rangefinder - Unless you’re a traditional archer, use a rangefinder. Estimating range is extremely difficult in rough terrain, especially when you’re peaking through cactus needles at ground level, or looking through tall grass across a deep draw. A rangefinder will tell you if you’re in range or if you have to keep stalking. Practice drawing and shooting from behind the horizon - That’s the shot you’re often left with when stalking bedded deer and it’s what separates the bow from the horizontally-held crossbow. Coming to full draw, raising up, aiming and getting the shot off on a mule deer, while breaking the skyline is extremely difficult. It’s a common scenario, and often unavoidable, but not impossible. Plot an Ambush - Getting in front of a moving mule deer can be a higher percentage shot, but that situation is more difficult to come by. You’ll have to pay close attention to where the deer are feeding, where they’re bedding, and how they are traveling from one to the other. It’s basic bowhunting. Unfortunately, mule deer aren’t quite as habitual as whitetails, so setting up in the right ambush location is a combination of analysis and luck. And in certain terrain where stalking is difficult, an ambush may be your only chance at a buck. Get in decent physical condition - There may not be altitude to contend with, but walking and crawling all day can be taxing. Have strong, fresh legs and wear good boots that support your ankles. The better shape you’re in, the better hunter you are. If the weather is hot, drink lots of water. Difficult is the key word when bowhunting mule deer. They are a great challenge for the bowhunter who likes to spot and stalk his game. Any muley buck taken by spot and stalk is a trophy. Had I taken that average 3X3 on that ridge I described earlier, it would have been one of my most memorable hunting experiences. He would have been a true trophy based on effort expended. Later that same evening, I drove up to an oil well platform to camp for the night. When I pulled into the approach in the darkness, there stood a beautiful, Pope and Young class, 4X4 buck, complete with sticker points, grazing in my headlight beams. He stood there grazing for long moments, as if to thumb his nose at me, then walked slowly off into the black night.